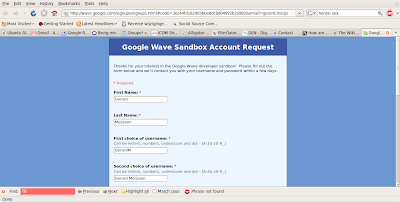 Today I was pleasantly surprised with an invitation to the Wave Sandbox. This is where Wave is finding its final form before it is released to the public. Getting an invitation at this stage is something that I consider a compliment; Wave is still very young and it is still being developed. The reason why I receive this invitation: I worked with Tom to get him his Wave account, I helped him find the funding to go to the Wave hackaton in Cupertino to develop the MediaWiki / Wave interface. I expressed the importance of the internationalisation and localisation of Wave. It may have all the WYSIWYG attributes that we are looking for in improved usability, but as long as it does not support our languages it cannot be adopted.